Next time you see a sturdy horse towing a rumbling dray through Rushden’s busy streets, take a second look. He is one of the few remaining picturesque links with a life that is past. At first sight there may be nothing inspiring about Rushden’s few hard-working horses. They are in a far different class from their brethren at Newmarket and Ascot, but to some of the men you may find in the stables at Newton Road and High Street they are real pals. It’s difficult to get on friendly terms with a snorting three-wheeled mechanical horse, and the men who spend their working days with “Prince,” “Bob,” and “Jack” shake their heads when one talks of petrol, electricity and progress. One can see from the very way they lead their charges through busy streets that they have no time for rush and tear. In spite of their surroundings they are still “The Draymen,” a class of their own. Once they were the undisputed kings of the road. They have not forgotten. Horses are being rapidly out-moded at Rushden, but a few can still be found at the British Railways and Co-operative stables. This old favourite of the streets is still on duty, but is rather lonely in the stables from which most of his colleagues have departed. (above right) The old stables for the Railway Station stood on the corner of Station Road and High Street. 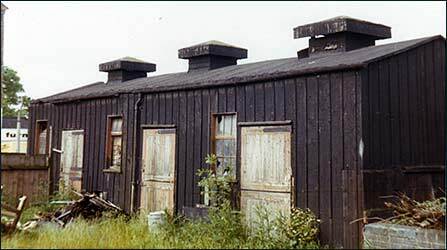 There is room for about 14 horses in the High Street stables belonging to British Railways, but now all but four of the white-walled, wooden cubicles which once housed the cavalry company of the L.M.S. are empty. “How many tons of goods can a horse carry in a year?” we asked Mr. Malloney. “Six tons a day, thirty tons a week, 52 weeks; you can work that out,” he said. Fifteen hundred odd tons a year should make any animal worthy of his keep. At the High Street stables there is a hospital bay so that any horse which looks under the weather can be safely isolated until a vet arrives from Wellingborough or London. If it fails to recover quickly, it will be replaced from London. That is one reason why no railway horse at Rushden has been in the stables more than about five years. 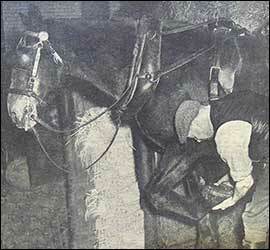 But pipe-smoking John Gordon, one of the draymen, has spent much of his time in the stables since he came to Rushden soon after the end of the Great War. His principal charge is “Bob,” a chestnut, and as he spread a clean wood-shaving bed in the stall, he spoke of his working hours, of the early turn which begins at 6.30 in the morning when the duty man has to rise in the dark to feed and water the horses. In the old days there were twelve horses in the white-tiled stables in Newton Road belonging to the Rushden Industrial Co-operative Society, but now “Ginger,” “Jack,” “Bill” and “Prince” are the only survivors. The decline of the stables started in 1919 when the first motor arrived, but in the last 20 odd years dark brown “Prince” has remained and become truly prince of the stalls. He is about thirty, and his second-in-command, “Ginger,” about 24. In the old days the harness room where a stove glows red beneath the gallery of hanging leather, was a cheerful common-room and mess-room for the drivers. But now, more often than not, the only occupant is Bert Hodgkins, who spends his working life tending to the needs of the animals, which are now used only for delivery of bread and milk. His day starts about 5.30, and the horses are fed, watered and groomed when they leave for the rounds at seven. He gets time off mid-day and then finished at six in the evening. He remembers the day, 19 years ago, when he was called at five, and finished sometimes as late as eight. Bert may sigh when he thinks of those long hours, but there is a far away look in his eyes when he turns to the walls once hung thickly with harness, and from the way he spoke of the value of horses in bad weather, one could see that here, at least, the horses had a friend. Transport foreman Walter Stocker said little, but he also remembers the day when the stables were in their prime. 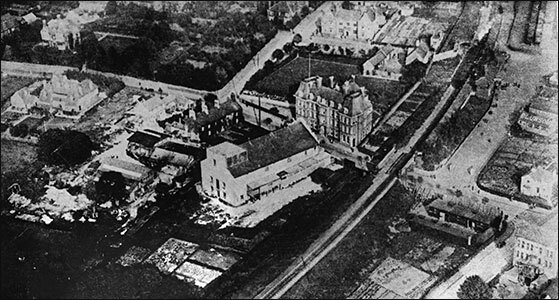 This aerial picture is the area where High Street joins Higham Road c1930. The Railway Station towards the top right corner, and the railway track. Sation Approach on the right - with the Station Master's house at the foot - where High Street meets Higham Road (across the picture) and Shirley Road. Towards the bottom right corner - the railway station stables and across the track, almost centre, is the Royal Variety Theatre, and facing it the grand Queen Victoria Hotel built in 1900. The row of cottages beyond the Royal Variety Theatre were Marriotts cottages, used as the offices for the building company, with Shirley Road leading up to North Street and top right of centre, The Police Station. For another aerial picture c1973.